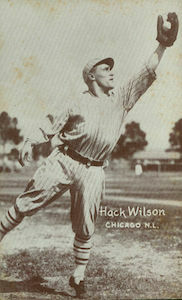 Lewis "Hack" Wilson spent his 12-year career establishing himself as one of the most feared power hitters in the National League. At the time of his retirement in 1934, he was one of only four players in Major League Baseball to hit more than 200 home runs, joining fellow Hall of Fame members Babe Ruth and Rogers Hornsby. Beyond the field, collecting Hack Wilson's baseball cards has always been a popular challenge to undertake. This top list examines ten of the best Hack Wilson baseball cards to chase. Shop for Professionally Graded Hack Wilson Cards on eBay. 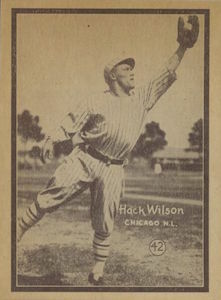 Hack Wilson's playing career began in the waining days of the 1923 season with the New York Giants. At the end of the 1925 season, the Giants left Wilson unprotected in the minors, allowing the Cubs the opportunity to claim him in the Rule 5 Draft. Hall of Fame manager Joe McCarthy installed him as the Cubs center fielder and encouraged him to swing away at the plate. The results were great for both Wilson and the Cubs. 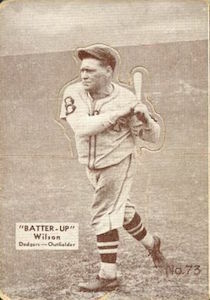 During his six-year stint with the Cubs, Wilson led the National League in home runs four times and set the MLB record of 191 RBIs during the 1930 season. Combining with Hornsby, Hack Wilson helped the Cubs reach the World Series in 1929 and he hit .471 in the Fall Classic. 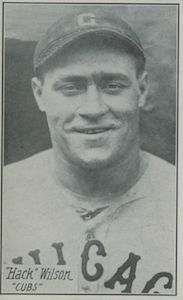 Wilson ended up spending his final seasons in professional baseball playing for the Brooklyn Dodgers and very briefly for the Philadelphia Phillies. 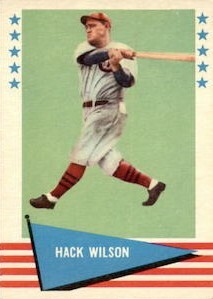 The Veterans Committee selected Hack Wilson for the Hall of Fame in 1979. The majority of Hack Wilson's baseball cards can be challenging to find, are often condition sensitive, and are not necessarily going to appeal to those collectors looking for a bargain. There are many modern Hack Wilson cards that are affordable, plentiful, and not too difficult to pick up for your collection. However, the most popular cards of the Cubs slugger pre-date World War II. Many of the cards were issued by various candy companies, ice cream producers, and several other sources that were common during the 1920s and 1930s. While collecting vintage cards made prior to World War II can be a challenge, both in terms the price of the cards and the availability of the cards, finding and adding these types of cards to your collection can be rewarding, offering collectors a strong sense of accomplishment. This Hack Wilson top ten list provides collectors with a wide range of baseball cards from throughout his playing career. One of the most affordable Hack Wilson cards comes out of the 1961 Fleer set. The early 1960s Fleer sets featured retired players who were often photographed during Old-Timers' Games or wearing street clothes. At the time of its release, the 1961 Fleer set was poorly received, but has become more popular with time. Despite the increasing popularity, many of the cards in this set are still very affordable. 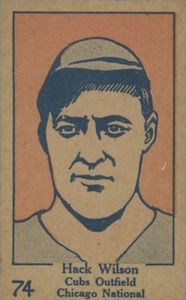 Wilson's card features him playing in a Cubs Old-Timers' game. The Chicago-based Exhibit supply company produced several different runs of these cards over the years. Measuring 3 3/8" by 5 3/8", the cards have been a popular choice for collectors looking in the 1920s and 1930s. 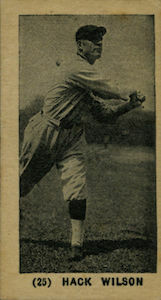 These cards were printed with postcard backs, black-and-white photographs, and labels with the player's name and team on the front of the card. 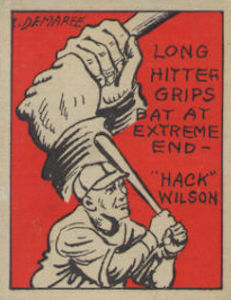 While several players are featured multiple times in the 68-card set, Hack Wilson only has one card. The 1934-1936 Batter Up cards were sort of the 1930s equivalent to the modern oddball set. National Chicle produced this set that had all sorts of variations in terms of the colors used on the cards and sizing. The cards were designed with a die-cut perforation around the player picture which allowed the card to be turned into a stand-up figure. The perforated edges on the card has placed a condition premium on Batter Up cards. Hack Wilson's card was released in 1934 with the first 80 subjects, and this early group is considered a little bit easier to track down. The card numbers are on the front of the card, but the 1934 cards can be distinguished from the two other batches, released in 1935 and 1936, due to the fact that they are a quarter-inch taller. The R315 release was a strip card set issued over multiple years in the late 1920s. Most of the strips contained three different cards arranged vertically. The cards featured black-and-white pictures, blank backs, and were oversized, measuring 3 1/4" by 5 1/4". Because many collectors hand-cut the cards to separate them out, there is a definite premium on condition. Occasionally, collectors can find the strips uncut. Besides the Hack Wilson card, several other Hall of Famers appeared in this set, including Babe Ruth and Lou Gehrig. W517 was another set issued in strips and they were 3" by 4" with dotted lines around the edges to show collectors where to cut. Depending on the quality of the person cutting the card, sometimes the dotted edging still appears on the card. The majority of the cards in this set were sepia and showed a portrait picture of the player or a posed action shot. The Hack Wilson card in this set is one of the more popular cards along with fellow Hall of Famers Babe Ruth, Jimmy Foxx, and Lefty Grove. The W513 set was a follow-up to W512, which was printed in 1927. These cards have a distinct look with their hand-drawn pictures and white borders. The 50-card set featured athletes from several different sports, including professional golfers and boxers. 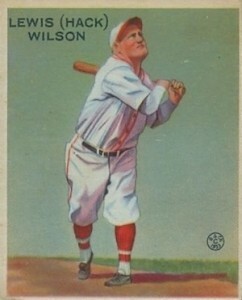 However, 26 baseball players were also in the set, including Hack Wilson as a member of the Cubs. The 1935 Schutter-Johnson cards are easy to recognize by their red backgrounds and black-lined borders. The 50-card set was made by the Schutter-Johnson Candy Company as a promotional item. The set features numerous Hall of Famers giving baseball tips and are paired with a drawing of the player. The complete set is extremely tough to assemble, but single cards turn up occasionally, though these cards are still pretty rare. These ice cream cards are another tough find from the 1920s. This set is similar to the Tharps, Sweetman, and Yuengling Ice Cream cards from around this same time. The Harrington Ice Cream cards were made by Harrington and Company of Dushore, Pennsylvania. While the fronts of the different ice cream cards from the late 1920s were similar, the backs of the cards often had a coupon for ice cream and also identified the company that produced the card. Like many of the other cards from this era, the Harrington's Ice Cream cards were hand cut and can have rough and uneven edges. This is one of Hack Wilson's more difficult cards to find and has a very low population of graded copies. 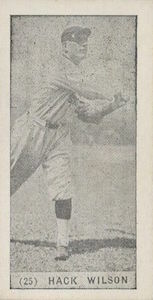 The E210 cards are some of the most popular cards from the 1920s. This set was made by the York Caramel Company and featured 60 different players, many of whom ended up in the Baseball Hall of Fame. While the picture is similar to the Harrington's Ice Cream card, there are some differences between the two popular Hack Wilson cards. The main difference is on the back of the cards where the the company brand names are shown. The York Caramel cards feature a one-sentence blurb about the player and the York Caramel name versus the Harrington's cards which, again, offer collectors a coupon. The 1933 Goudey Hack Wilson is the official rookie card of the Hall of Fame outfielder. This set is noted for its colorful backgrounds with contrasting action and portrait colorized pictures. These cards were the first product packaged specifically as a set of baseball cards, which were also sold with one stick of bubble gum per pack. The backs of the cards featured a short blurb about the player and "Big League Chewing Gum" was stamped across the bottom. Hack Wilson's Goudey rookie is easily his most popular and most in-demand card. 2016 FLAWLESS TEAMMATES GU BATS PATCH BILL TERRY HACK WILSON JOHN McGRAW 1 1!! 2017 Panini National Treasures HACK WILSON Base Platinum CUBS GU Bat 1 1 RARE! 1933 Goudey #211 Hack Wilson HOF Dodgers PSA 3 !!! 1931 W517 #42 Hack Wilson Cubs HOF SGC 2 ! !